This project was created on 04/08/2019 and last updated 8 days ago. This project aims to create various devices for a "smart home" that do not involve major changes to existing systems. All nodes must be transparent to the existing system and can be linked together to exchange information with each other and over the internet. The first subsystem I&apos;m working on is the light control. 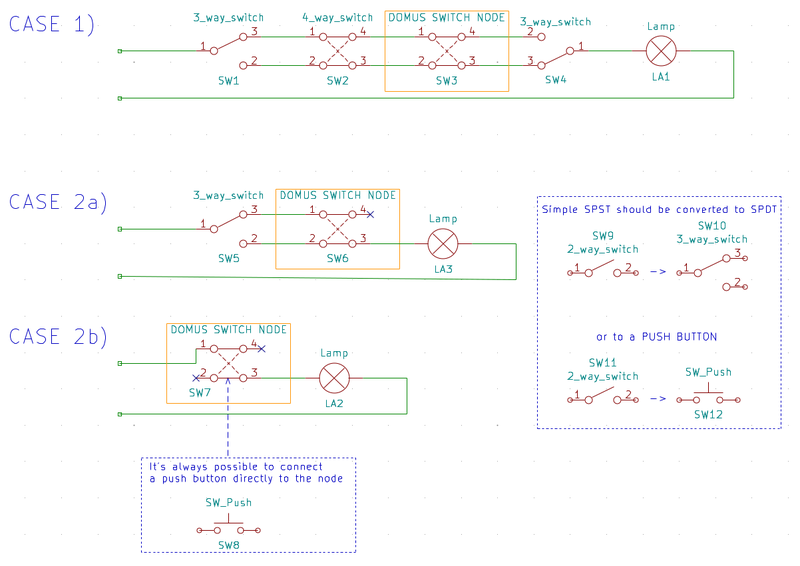 To ensure that it is possible to drive the light from any switch the node must behave as a 4 way switch. The first case is the simplest, it is sufficient to connect the node in series to the switches . The second case is slightly more tricky, it is necessary to replace the single switch with a 2-way switch and put it in series with the node [2a], or with a push-button connected directly to the node [2b]. This project aims to bind all IoT devices together in a single unified voice controlled interface. You are about to report the project "DOMUS ", please tell us the reason.